The rise of influencer marketing is understandable. It delivers results. The fact is: consumers trust recommendations from third parties more than branded media (Kissmetrics). 67% of consumers agree that an endorsement from an unbiased expert makes them more likely to consider a purchase (PR Week). But less than 25% of consumers trust most online advertisements (Sujan Patal). But how can we guarantee success with influencer marketing? An important question to consider is what type of influencers you want to reach. Enter the global vs local debate. Global influencers have admirable reach and influence worldwide. So why should we consider local influencers? In this article, I discuss 9 reasons why you need to connect with local influencers, and unpack the reasons for each. It’s not possible to influence everyone. Influencers influence their target demographic – not every target demographic. After all, people are more likely to trust someone that’s close to them, as opposed to someone on the other side of the world. But how do local influencers leverage so much influence and impact in the local population? 1. Local influencers have already built trust and authority in the market. They have proven their credibility with the target demographic and can help spread the word about your brand because of their reputation (Techco). Using local influencers enables you to leverage the personal connection they have with their target audience. For example, they might write a compelling review of your product. By recommending your product, the authority transfers to you and your product, which in turn convinces prospects to buy. 2. Local influencers already have an engaged local audience. The influencer can share their audience with you. For example, they might share your content with their Twitter followers. Whilst the size of their following might be smaller than global influencers, they generally enjoy higher engagement due to the close connection with their audience. 3. Local influencers are well connected. They might introduce you to a business partner who could help you to tap into promotional opportunities in the local market. 4. 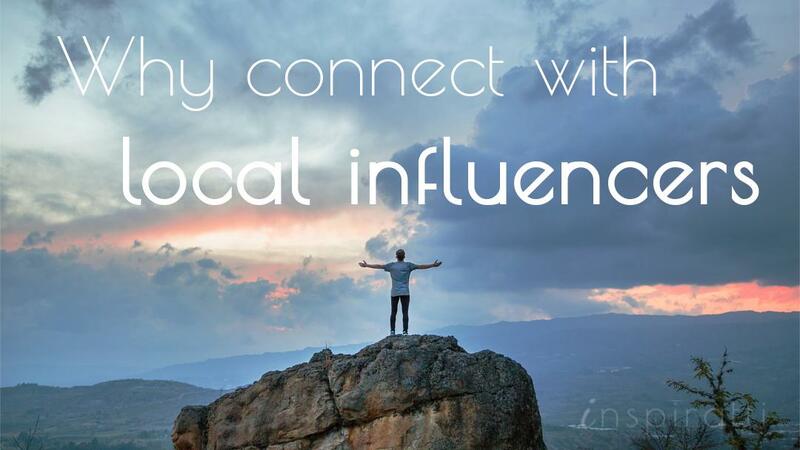 Local influencers can help improve your local SEO. By spreading the word on social media and through natural links, publicity from a reputable local influencer will help you gain more authority and improve your local ranking in Google (Techco). 5. Local influencers have relationships with their followers that more closely resemble what they have with their friends. And that’s what today’s customers crave (Marketing Profs). Nielsen found that 92% of consumers trust their peers, compared to only 18% that trust celebrities and well-known bloggers that they perceive as having an agenda (Sujan Patal). Local influencers also have more opportunity to meet prospects offline, which provides the foundation for a more personal relationship. 6. Local influencers are more able to capitalize on the psychological need for belonging. People like to be part of groups (Andy Maslen). They like to feel connected with likeminded people. They like getting access to privileged information they receive for being part of the group. “The most innovative influencers make their local audiences feel like they share experiences with them and inhabit a common sphere of social activity” (Marketing Profs). “A strategy that focuses on targeting the right audience and providing them with great, relevant content will not only increase engagement, but will help to keep your brand ‘top of mind’ to that audience”. Local influencers possess insider market knowledge. This means they are better positioned to deliver highly focused content catered to local interests and needs. Let’s explore why. 7. Local influencers know the local language and cultural customs. Europe and Asia are made up of a diverse range of languages and cultures which requires more strategic planning when creating a global influencer program. Local market activation is vital in these markets; global influencers often lack the specific cultural knowledge to influence certain target markets (Onalytica). 8. Local influencers are close to the action. They know what is happening at the local level: what is worrying, exciting and annoying people. Local influencers not only speak the local language, but they also know the colloquialisms, references and even in-jokes unique to the market. Local influencers are therefore better equipped to deliver more authentic communication and speak to the audience in a way they feel comfortable. 9. Local influencers understand local marketing channels. This means they know which networks to use and how to use them. Say you want to use Renren to reach Chinese college kids. But you lack authority on the network and don’t know how to leverage it to best effect. A relevant influencer knows how to tap into the key networks in the local market. The spectacular rise of influencer marketing has created huge audiences for individuals with unique voices ([a]listdaily). However, simply reaching out to local influencers does not guarantee success. It needs to be backed up by a solid strategy that supports your business goals. That requires selecting the right influencers and proposing a strategy that benefits both the influencer and your brand. Marketing Profs argues that the secret is to seek out local influencers who have built their followings organically. They have dedicated the time to gain influence with the local audience through word-of-mouth and the power of networks. This results in a higher level of trust that is transferred from the influencer to the brand to the consumer. So how exactly do we go about implementing an influencer marketing program? Read the next post where I outline how to find, connect, and leverage local influencers. What tactics do you use to connect with local influencers? Share your tips in the comments below.